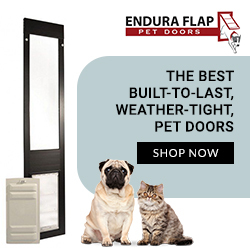 What’s the best pet door? If you are like most pet owners you have most likely have asked yourself this very question. Chances are you have also gone through the pros and cons of installing one. Pro #1: A pet door frees us from the chore of getting up to open the door every time your dog /or cat wants to go outside. Pro #2: Your pet can get some unsupervised fresh air and exercise, whenever they want to. Pro #3: Because your pet is free to go outside when he/she wants they are less likely to get bored and take out their frustrations on furniture and other indoor objects. Pro#5: Dogs who have the ability to go outside at their own will are less likely to be over anxious when they greet you when you return home. Pro #6: If there is an emergency like a fire your pet can escape. Con #1: Safety Concerns. If you live in an area where there are wild animals you may not want your pet to go outside unsupervised. Con #2: You must have a fenced in yard where your dog can go unsupervised. Con #3: May require a permanent alteration to your house, or at least the door. Con #5: Safety concern of other animals entering your home. Whatever your concerns about having a pet door installed, rest assured that Pet Door Manufacturers have the solutions to your objections. There is no one solution that will satisfy everyone’s needs but there are solutions to everyone’s problems. Here is a list of pet doors that will hopefully fill your need and put any concerns you may have to rest.